When my son was a kid, one morning he spilled something at the table. With orange juice or whatever it was running everywhere, Laura felt that this was a teachable moment. He was still little, but old enough to start taking some responsibility for his own messes, so instead of just cleaning it up for him she told him that he needed to help her. Less than excited about the possibility, Josh resisted a little. “When you grow up, your wife isn’t going to want to clean up your messes,” Laura told him. Josh cleaned up the mess. I tried my best not to laugh, and mostly failed. When I was a kid, the “traditional” roles for men and women still mostly proliferated. My sister and I were teenagers, or almost, when Mom took a part-time job as a church secretary. She still got home about the time we got home from school. I was in high school, or maybe even past high school, when she really restarted her career at a large hospital. Until then, Mom was the traditional mother and housewife. She’d drive us to things, cook meals, take care of the house, and, yes, clean up our messes. Thinking back on it now, most of my friends grew up the same way. Their moms were home during the day, like my mom. Those who weren’t, as I remember it, were the ones whose husbands were no longer in the picture. They “had to work,” you see. It doesn’t seem that long ago, but in some ways it was light-years from the world we live in today. In a lot of families now, both parents have jobs outside the home. When a parent does choose to stay home, it isn’t always the mother anymore. Women can take maternity leave knowing their jobs will be there when they return. Traditional roles have changed. Expectations are different. To borrow Josh’s expression, “agreeable” wives don’t look the same as they used to. In the world Jesus lived in, the expectations for women revolved around the home to an even greater extent than the prevalent expectations of America 40 or 50 years ago. For women, care of the home and family was their sphere. Why would they be at public gatherings? What business did they have interacting with men who weren’t their husbands? Why would they need to learn a trade or get an education? None of that had to do with the raising of children and the handling of the business of the home. In the case of Mary and Martha, you see those expectations made explicit. Martha is furious, and — from the point of view of the world in which she lived — justifiably so. To her way of thinking, Mary has no business sitting out there listening to Jesus teach like…like she thinks she’s one of his disciples. There’s work to be done. Food to be prepared. All these guys are going to want to eat soon. Dinner won’t make itself. To our ears, her complaints sound unenlightened and sexist. “If those guys are hungry enough, they’ll find something to eat,” we’d say. But this is her world, not ours, and in her world her complaints are absolutely understandable. If there were 13 guys in that room with Mary, I guarantee you that 12 of them were thinking some version of the same thing. The one who isn’t thinking that, though, is the One whose opinion matters. “Mary has chosen what’s better,” Jesus tells Martha. He gently chides her for being concerned about so many things, being so caught up in all that society expects women to be, that she’s lost sight of the one thing that does matter — the kingdom of God. Trying to be the woman her world says she should be has made it impossible for her acknowledge that her sister has made the right choice in sitting and listening to Jesus. Jesus isn’t telling Martha, as we sometimes assume, that it’s wrong for her to do the things women traditionally did in her world. The problem is that her preoccupation with what women are supposed to be and do — not to mention her own stress and anxiety — doesn’t leave a lot of room for Mary’s desire to be a disciple. Jesus didn’t share the assumptions about women that ran unquestioned throughout the place and time he lived. If you want to talk about how Jesus treated women, you really have to start there. Luke — who mentions women pretty often in his gospel — tells us that several women traveled with him and helped to support him. They’re mentioned in the same breath as “the Twelve” — they’re disciples, just like those men whose names are better-known. 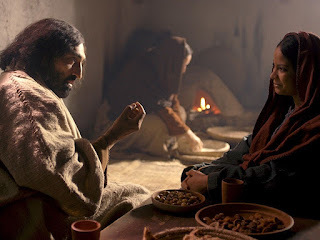 If you wonder how common that was in his day, look again at how frustrated Martha gets at her sister sitting and learning from Jesus in her own house! Don’t let your assumptions about what women should be go unexamined — even if you’re a woman too. Those assumptions come from all kinds of places, from what we had or didn’t have growing up, from what we are or wish we could be, and streams from a thousand other sources. They come together in confluence and lead us to make pronouncements about what is “better” for women to do, to be, to aspire to, to value. Often, those assumptions have a lot to do with how women are treated in our world: whether they’re listened to, respected, seen as credible, and accepted, or whether they’re dismissed, ignored, overlooked, and patronized. Women are abused in our world for not being “better” wives. Women are told how it would be better for them to dress, to whom they should speak and how, where it’s safe for them to go. They feel tolerated, not welcomed, in many companies and organizations where they have to navigate a labyrinth of expectations in order to carve out some kind of a place for themselves. Let’s face it: even in churches women aren’t always welcomed as equals. If we follow Jesus, we’ll say with him that what’s “better” for women is the same thing that’s “better” for men. Instead of being concerned with the “many things” that society tells women they should be, we’ll all together, women and men, choose the better thing of sitting at his feet and learning from him. Surely we can all be agreeable about that.